On any given day you might catch a video crew filming a BMX pro, a pack of Hasidic Jewish teenagers clad in official uniform, trading out their heavy black hats for bright-yellow dirt-jump helmets. 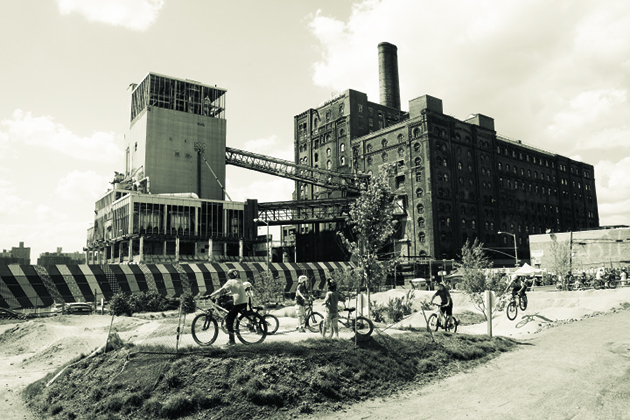 TUCKED BETWEEN NEW HIGH-RISE CONDOMINIUMS ALONG the East River with the monolithic Williamsburg Bridge looming overhead, 15 kids pedal around a pumptrack in an open lot. One kid gingerly steers his mini-bike over a log feature. Another takes aim at the highline of a berm and madly attempts to ride straight up it. As his speed peters out at the top, he lets the bike fall to the side and laughs. It's an afternoon birthday party at the Brooklyn Bike Park. Regulars Isaac and Mateo are turning 9, celebrating with 13 friends, a few of whom have never ridden on dirt before. The adults at the party are barbecuing and drinking beer under a tent next to the track. Isaac's father, Rick Herman, is an avid mountain biker. He began frequenting Brooklyn Bike Park shortly after it was built last summer. Although New York City's other four boroughs have some form of dirt track or mountain-bike trail system, this is it for Brooklyn. "I love this place," Herman says before jumping on a bike and pro- viding the kids with a tutorial, ripping a couple of laps around the track. The park was built courtesy of a large grant from the real-estate developer who will transform the space into condominiums after the bike park's lease expires in September. It's composed of beginner- and intermediate-level pumptracks that share a lot with a community garden. "Our big thing was to give people a taste, show them it was actually possible," says Pete Kocher, who with his wife Jessica co- owns Ride Brooklyn, the shop that brought the park to fruition. "We set it up as a not-for-profit so we'd have a place to raise money to set aside for the park's next incarnation." The hope is to move the bike park to a public place, ideally to nearby East River State Park or even Prospect Park. "It was a great opportunity to get something going that people in Brooklyn really wanted and needed, not just mountain bikers and BMXers, but people from all walks of life–Hasidic kids, rich kids, poor kids," Kocher says. And it's going. On any given day you might catch a video crew filming a BMX pro, a pack of Hasidic Jewish teenagers clad in of- ficial uniform, trading out their heavy black hats for bright-yellow dirt-jump helmets. Or you might see a couple of 50-somethings in evening wear, hipsters in skinny jeans and a mom following around her brave toddler. As many as 50 dirt lovers can be found riding hot laps on the track at once, all soaking it up while it lasts. This story originally appeared in the August 2014 issue of BIKE.